Constructed in the late Northern Wei and the early Western Wei, this single-chambered cave is square in plan with a truncated pyrmidal ceiling. The ceiling center features a combination motif of an inverted lotus, flames, honeysuckles and lotuses. The four slopes are devoted to the paintings of "the heaven and earth with various images." The upper part depicts a world where Buddhism coexists with Taoism. In the center of the west slope is four-armed four-eyed Asura guarded by two dragons standing in the sea and holding the sun and the moon in his hands. Behind him are Mt.Sumeru and the Tusita Heaven. On both sides of Mt. Sumeru are gods of the Thunder, the Lightning, Wind and Rain who created a scene of thunder and lighting, in addition to the Scarlet Bird, Wuhuo, Garuda and apsaras. In the upper center of the east slope is a Mani Pearl held high by two guardian warriors and flanked by apsaras. The Scarlet Bird and the peacock fly towards each other. The image of King Father of the East on the upper part of the north slope is partly damaged, but his four-dragon-drawn chariot is still visible. The Queen Mother of the West on the south slope wears a high chignon and loose-bodied robe. She sits on a three-phoenix-drawn chariot sheltered by a parasol. A large arch niche in the west wall contains a central Buddha and two bodhisattvas. The heads have been renovated. The central Buddha sits with legs pendent, wears Sankaksika, cross-collared Chinese robe and an outer red Kasaya, open in the front, which has a knot at the chest. The left hand was renovated in later times. On the west end of the side walls, two bodhisattvas stand symmetrically on a lotus throne with necklaces. They slantly wear a long skirt. The four walls are divided into three registers. The top registers of the four walls form a circle of heavenly musicians. On the middle register inside and out side of the west niche are apsaras, attendent bodhisattvas, Vasistha and Mrgasirsa; The two side walls each have a preaching scene in the center with rows of donor figures surrounded by the thousand Buddha motifs. On the lower register are guardian warriors. The front chamber of this cave collapsed completely and the east and north slopes of the ceilings are also partly damaged. The remaining parts are basically intact. The south wall is divided into three horizontal registers. On the upper one are eighteen heavenly musicians and a head image of a god in the Tusita Heaven. The middle center is covered with a preaching scene in which there are two apsaras on either side of the Buddha and two bodhisattvas below. The three sides except the lower part of the preaching scenes are covered with the thousand Buddha motifs. Below the preaching scene are several donor figures, most already obscured. The bottom registers on the four walls are used for images of yakshas and guardian warriors, most obscured. There is a bodhisattva statue on the west end against the south wall. 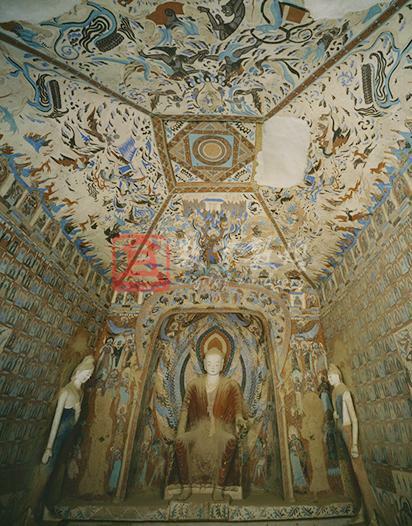 The large niche in the west wall houses a central Buddha statue, and behind the statue on the wall are images of a nimbus and a halo of flame motifs. The wall in the niche depicts apsaras and bodhisattvas from top down. The lintel is decorated with honeysuckle motifs, incarnated children and musicians. The pillars of the niche wrapped with the silk are rendered in bas-relief, and the dragon-head of the pillars and the statues of bodhisattvas on two sides of the niche are lost. The upper parts of the two sides out of the niche are occupied by heavenly musicians above, apsaras and bodhisattvas below. The north wall is divided into three registers. The upper one contains twenty heavenly musicians, and the middle one has a preaching scene in the center, whose composition is similar to that on the south wall. Below the preaching scene are several attendant bhiksus, twenty male donors, and twelve upasakas. The lower register contains a row of yakshas, and seven of them have survived till today. The east part of the north wall is destroyed, and there is a bodhisattva statue on the west end against the north wall. The upper center depicts a Mani Pearl on a lotus flanked by two apsaras and held high by two guardian warriors below. On the south side of the warrior is a peacock, and on the north side is a scarlet bird. The lower part depicts many images from Chinese mythology. In the lower mountains forests are scenes of the secular world, part of which is damaged. Today, only part of the mountain, trees, a monkey and an incomplete horse are visible. The top center depict Queen Mother of the West riding a phoenix-drawn chariot let by a celestial being riding a phoenix in the front and followed by asparas behind. In addition, Kaiming (a magical beast), White Tiger, Wuhuo are flying in the sky. In the mountain forests below are images of goats, wild oxen, wolves and plumed human beings. In the center of the west slope is four-armed and four-eyed Asura standing in the sea and holding the sun and the moon discs in his hands. Above his head are Mt. Sumeru and the Tusita Heaven with the gate half closed. On the right side of Asura are gods of the Thunder, Lightning, garuda, winged human being, birds and beasts, and on the left side are gods of the Wind and Rain, Wuhuo, celestial beings and apsaras. There are also celestial beings, monkeys and Scarlet Birds. In the center is King Father of the East sitting in a dragon-drawn chariot. Now only the four dragons, the chariot as well as the attendants around are visible. The upper part of the chariot is damaged. There are also mythic images of Wuhuo, Kaiming, plumed human beings, Yuqiang, and Feilian. The ceiling center features a pattern formed by concentric circles of lotuses dotted with leaves and honeysuckles in the inner corners, and in the four corners of the laternendecke are honeysuckle and lotus motifs.